San Diego's Seaport Village is a shopping and dining complex similar to those found in many tourist-filled cities, mostly targeted toward visitors and good for a few hours of fun. Seaport Village is a good place to have a meal with a waterfront view or to pick up a souvenir of your visit. While it's not among my top places to go in San Diego, a lot of other people disagree, giving it very high ratings on Yelp. This comment summarizes what they have to say: "Fun cute stop for shopping and food. Located on the Harbor so you can watch the ships come in and out." In April, some of the world's best street performers join those who work at Seaport Village during the Busker Festival. In September, you can celebrate Landlubbers day, in honor of Talk Like a Pirate Day. Surfin' Santa splashes ashore in late November and hangs around for photos through Christmas. Most people go to Seaport Village to shop and eat. More than a dozen casual dining spots serve pizza, sweets, burgers, sandwiches, and snacks. Four restaurants claim "bay view dining" and all offer views, but only the San Diego Pier Cafe is on the waterfront. If you are looking for an indulgent treat, try Frost Me Gourmet for the best cupcakes in town. They have a cute patio, wild flavors like Chocolate Dulce de Leche Habanero — and they are proud winners of The Food Channel's Cupcake Wars. Shoppers will find almost fifty Seaport Village shops selling collectibles, clothing, jewelry, and souvenirs, and most shops are one-of-a-kind. One of the best Seaport Village shops is the Wyland Gallery, a showcase for one of California's foremost marine artists, worth a visit even if you can only afford to look. Children and carousel-lovers of all ages will enjoy Seaport Village's 1890s Looff Carousel and its fanciful steeds. A video arcade caters to the electronically-addicted. With frequent concerts in two plazas and strolling musicians, Seaport Village is a musical place. Free public concerts are scheduled most weekends and some weekdays. The San Diego SEAL Tour departs from Seaport Village, taking you on land and sea in an amphibious vehicle. San Diego Trolley Tours stop there as well as other sights, and it's a good way to get around town without driving and parking hassles. Seaport Village is open every day and shops have later hours in the summer. Go in the morning for smaller crowds, mid-day for a meal or snack, or in the evening to watch the sunset. If you don't like shopping, take a walk along the waterfront instead. The views toward Coronado Island, Coronado Bridge, and from the pier around to the marina are photogenic enough to keep you busy for a while. Pick up a brochure. Not only does it have an event schedule, but it also has coupons for purchase discounts and free gifts. If you park in the Seaport Village parking lot, take your ticket with you for validation with purchase. 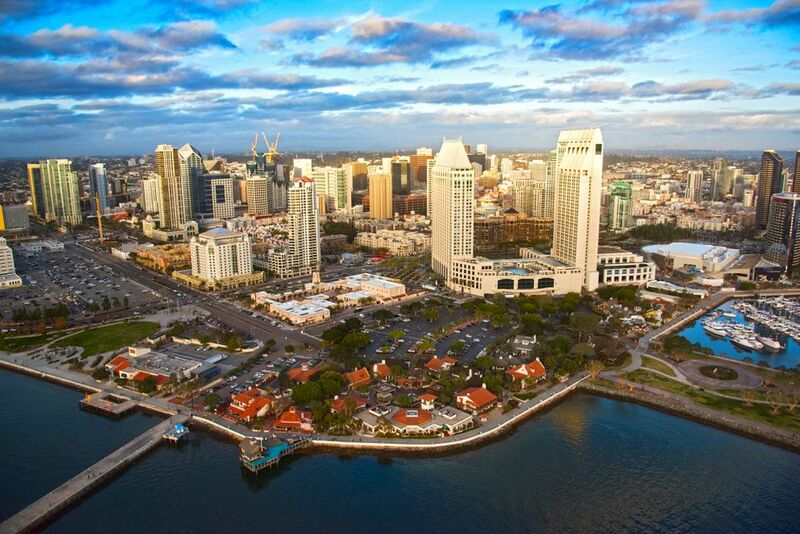 Where Is Seaport Village Located? Seaport Village is south of the cruise ship terminal and USS Midway. It's easy to get to from anywhere in San Diego. If you're in the Gaslamp area, walk toward the waterfront on Kettner Blvd., crossing Harbor Blvd. If you arrived on a cruise ship that's just in port for the day, you can use their free shuttle from the cruise terminal. To avoid traffic and parking hassles, take the San Diego Trolley to Seaport Village Station and walk. Hail a pedicab (an open-topped, bicycle-powered vehicle). They charge a flat fee for a point-to-point trip, and rates are somewhat negotiable when they're not busy. Drive along Harbor Drive from the airport and waterfront, or take Kettner Blvd. or Pacific Highway out of downtown. Water Taxis stop near Greek Islands Cafe and are a good way to get to Coronado from Seaport. You can summon them by calling 619-235-8294.